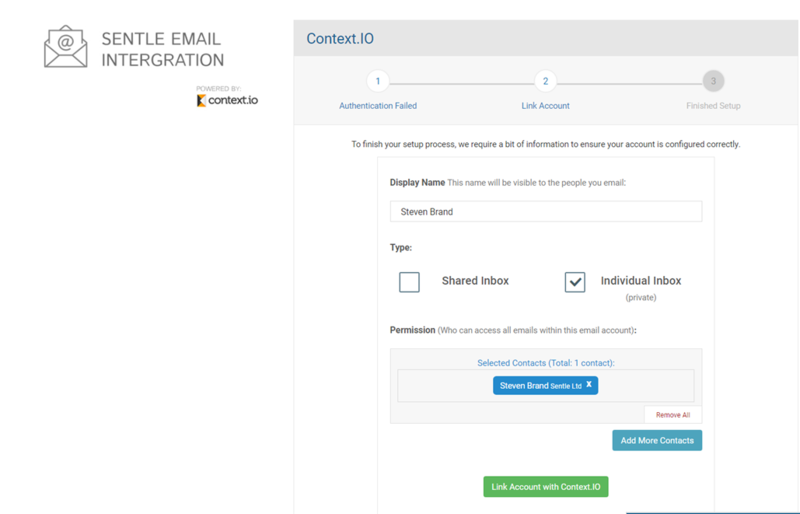 Sentle allows you to integrate directly with your email account, allowing for all email to be sent from Sentle with emails to known contacts being stored against their activity history. This article will take you through the steps required to set up email so you can start sending and receiving emails through Sentle. 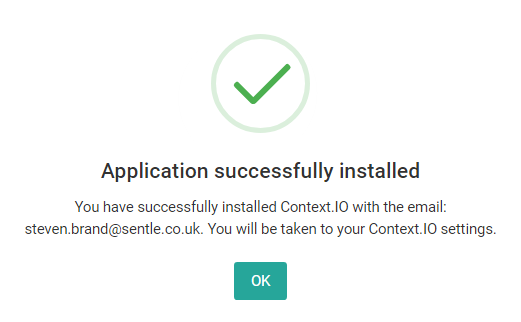 From here locate the ’Sentle Email Integration’ box and select the green ‘View Application: Context.IO’ button. In the next step you will need to add the email credentials used to configure your email server. If you don’t know what these are your IT department or provider should be able to share these with you. With the previous steps complete, you’ll see the following screen where you can add a display name for the email and mark whether the box is ‘shared’ or ‘individual’. You are also able to set permissions to give staff access via the normal contact search mechanism. NOTE: Only Sentle staff will show up in this search. Press ‘Link Account with Context.io’ to continue when complete. Congratulations! You are all set up and good to start using email through Sentle. Please refer to the other email articles for instructions on sending, receiving and managing emails. Please note: This service is provided by sharing email data of which you can opt out. Please contact us at support@sentle.co.uk if you wish to.